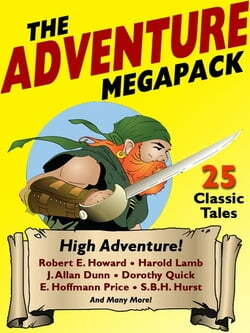 Hours of great reading await, with adventure tales culled from the pulp magazines of the early 20th century by some of the most renowned pulp authors, including Robert E. Howard (creator of Conan the Barbarian), Harold Lamb, William Hope Hodgson, Dorothy Quick, E. Hoffmann Price, and many more! More... read more than 500 pages of fiction! (Search for ?megapack? to find all the other great titles in this series.) Included in this volume: THE BLACK ADDER, by Dorothy Quick EVERY MAN A KING, by E. Hoffmann Price SON OF THE WHITE WOLF, by Robert E. Howard PEARL HUNGER, by Albert Richard Wetjen A MEAL FOR THE DEVIL, by K. Christopher Barr JACK GREY, SECOND MATE, by William Hope Hodgson SAID AFZEL'S ELEPHANT, by Harold Lamb ADVENTURE'S HEART, by Albert Dorrington ANOTHER PAWN OF FATE, by F. St. Mars MYSTERY ON DEAD MAN REEF, by George Armin Shaftel HAG GOLD, by James Francis Dwyer MAORI JUSTICE, by Bob Du Soe JAVELIN OF DEATH, by Captain A.E. Dingle THE SCREAMING SKULL, by J. Allan Dunn SIX SHELLS LEFT, by Allan R. Bosworth GODS OF BASTOL, by H.P. Holt THE MINDOON MANEATER, by C.M. Cross THE SPIRIT OF FRANCE, by S. B. H. Hurst THE BOX OF THE IVORY DRAGON, by James L. Aton CHECKERED FLAG, by Cliff Farrell THE FIGHTING FOOL, by Perley Poore Sheehan GHOST LANTERNS, by Alan B. LeMay STORIES OF THE LEGION: CHOC, by H. De Vere Stacpoole THE WHISPERING CORPSE, by Richard B. Sale THE MONKEY GOD, by Jacland Marmur And don't forget to search on "Megapack" in this ebook store to see additional great volumes in the Megapack series, covering science fiction, fantasy, horror, westerns, and more!